Of the many things for which the state of Jalisco is famous, the alcoholic agave-based spirit known as tequila tops the list. Indeed its birthplace—a town aptly named Tequila!—lies just 65km northwest of Guadalajara, making for an easy and popular day trip from the city. If there is one certainty in life, it’s that drinking and driving don’t mix. And yet, when in Mexico—especially when tequila country is practically on your door step—all the rules seem to go out the window… That’s really the only explanation I have for how we wound up spending one of our final days in Guadalajara on a self-guided tour through the heart of Tequila and its many distilleries. Sure we could have taken a group tour or even a fancy party train, but the freedom and flexibility afforded by our own set of wheels was too great to overlook. At least we never went above the speed limit and always wore our seatbelts??? Safety first! The tequila industry is one of the biggest tourism draws for Jalisco—in fact, although the liquor is distilled throughout most of Mexico, in order for it to be named tequila, it must be produced within Jalisco (and a few municipalities in four other states); everywhere else, it is called mezcal. Despite this, finding even basic information about visiting distilleries (like, what they’re called and where they are located…) is a bit slim and annoying to ferret out for independent travelers, even for a self-confessed research nerd like myself. I wound up finding this site which mentioned various towns and attractions (including distillery names and addresses!) along the official tequila trail and decided that, in the spirit of adventure, that would suffice. Equipped with a low-quality map that we could just barely read, we hopped in the car and left the metropolis of Guadalajara behind. 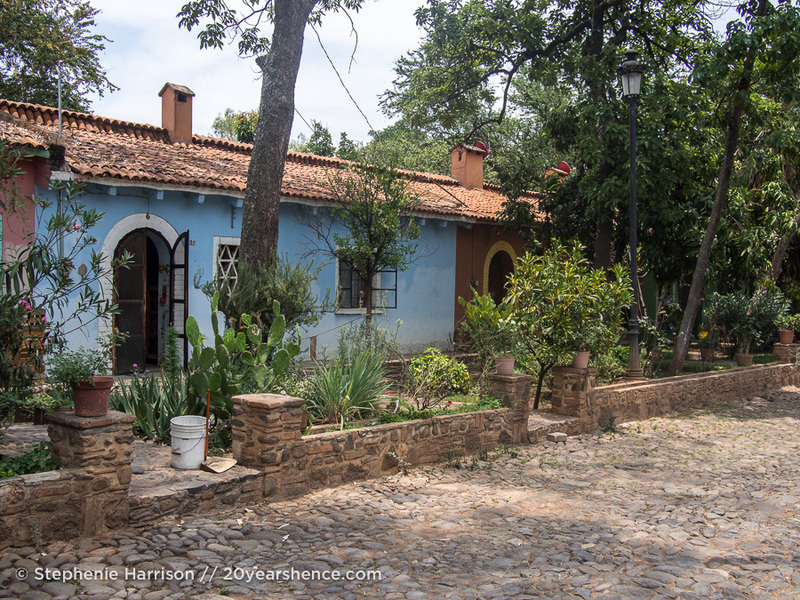 Although most tourists make a beeline straight for Tequila proper, our first stop of the day was the sleepy town of Amatitán. 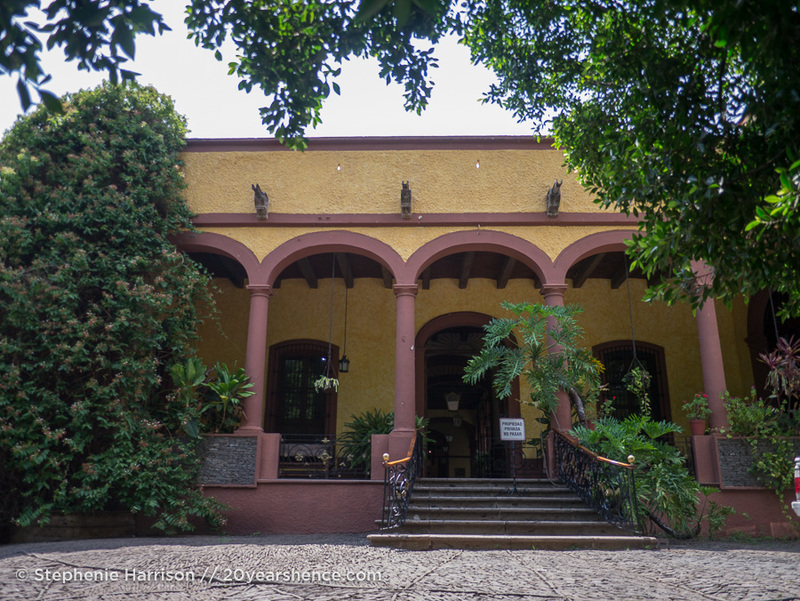 Here, located within the centuries old Hacienda San Jose del Refugio, sits Casa Herradura, rumored to be the most charming and atmospheric distillery on the trail. We didn’t realize this at the time, but tours are offered on the hour—thankfully we pulled up at 10:50 so we only had a short wait before our tour began. Our tour kicked off in the main courtyard which was not only incredibly pretty but also contains housing for the hacienda’s jimadores (field workers) and their families. 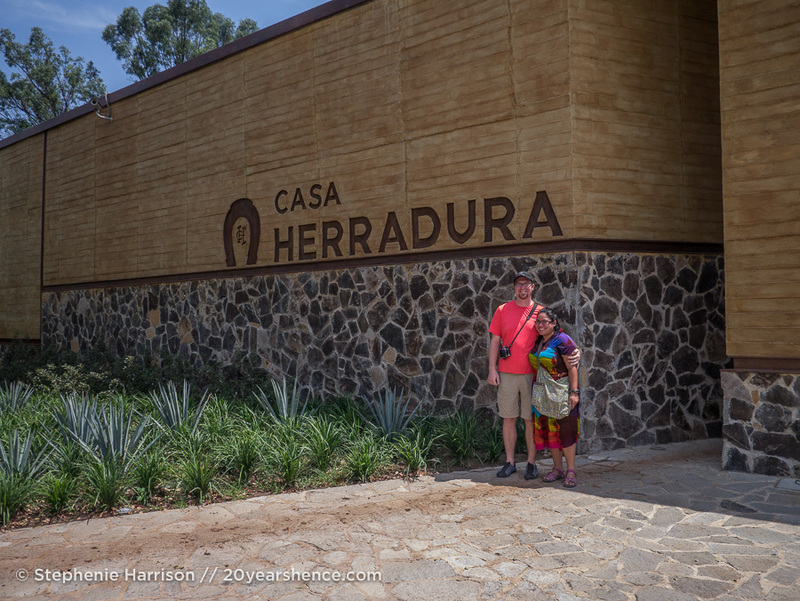 So long as at least one member of the family works for Casa Herradura, the house can be passed down from one generation to the next. The hacienda opened its doors in 1870 and there are apparently a few families who have been there since the start! As we would soon learn, working in the agave fields is a tough job, but as far as employment perks go, getting your housing thrown in—and in such a serene and lovely location—is a pretty good one. Zipping off in a Casa Herradura golf cart, our guide drove us up to the main building, a private residence that the owners of the hacienda still use to escape the heat of Guadalajara and for swanky fiestas. Next to it lies a shady courtyard which used to act as the hacienda’s stables, but has since been converted into a massive library. 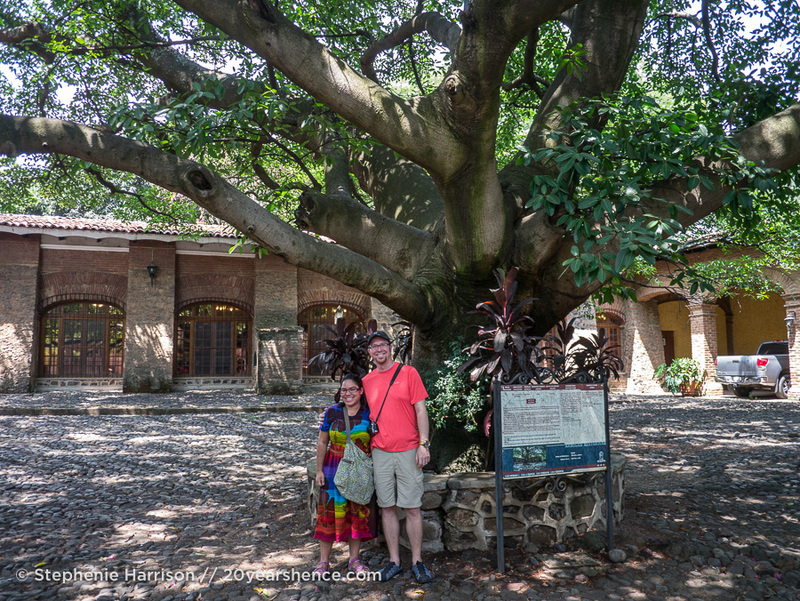 In its center stands a massive tree that is as old as the hacienda itself; local rumor holds that anyone who touches it is granted good luck, so we gave it a gentle caress before being whisked off to the blue agave fields. A jimador decked out in his workman’s best gamely gave us a demonstration as our guide explained the labor-intensive process that goes into harvesting the agave plants that are used in tequila production. Supremely spiny and prickly, the shoots are removed from the large hearts, which are called “pineapples” due to their resemblance to the fruit. The pineapples are then chopped so that the core/choke can be removed—this part of the plant is extremely fibrous and, when split, the pieces seemed to be glued together by a wet cobweb. This part of the plant is what is used to create the popular (but gross!) drink pulque, and if it is not removed, would make the tequila very slimy and bitter. It’s hard work—most jimadores work a six-hour shift—and we learned that the name “jimador” is a reference to the grunting sounds of exertion that the workers in the field would make when hacking up the agave plants. From there it was off to the ovens where the agave are cooked using steam, which releases the natural sugars in the plant which will be critical for the fermentation process. The juices are removed from the plant, and then the liquid is tested to ensure it has just the right balance of sweetness—if not, some natural agave sugar is added (so that the final product can be proclaimed as 100% agave); if it’s too sweet, then filtered mineral water is added. We then took a break from learning about the science and method of making tequila to coo over and pet Casa Herradura’s local burro, Cuco! He was hard at work eating as much grass as possible and steadfastly ignoring all of our overtures and attempts to get him to smile for the camera. Best intermission ever! Bidding Cuco a reluctant farewell, we headed over to the fermentation tanks. This is where my inner science nerd went wild. You see, in order for the sugars in the agave juice to ferment, you need a bacteria to be present—it eats up the sugars, and the result is carbonation (initially) and alcohol (end product). In most liquors, including tequila, yeast is used to catalyze the fermentation process. But at Casa Herradura, the vats are actually left open and a beautiful garden of trees surrounds the fermentation building; we learned that natural bacteria from these trees migrates over to the vats and ferments the agave, making the process 100% natural. We’ve done a few distillery tours in our time (most notably in Kentucky on the Bourbon trail), and this is the first time we heard of anything like this. So. Frickin. Cool! Following fermentation, the liquid must now be distilled which allows for the alcohol to be separated from the water. This is done by cooking the fermented agave mash in a stainless steel still where the alcohol boils off as steam and is captured and then condensed back into liquid. 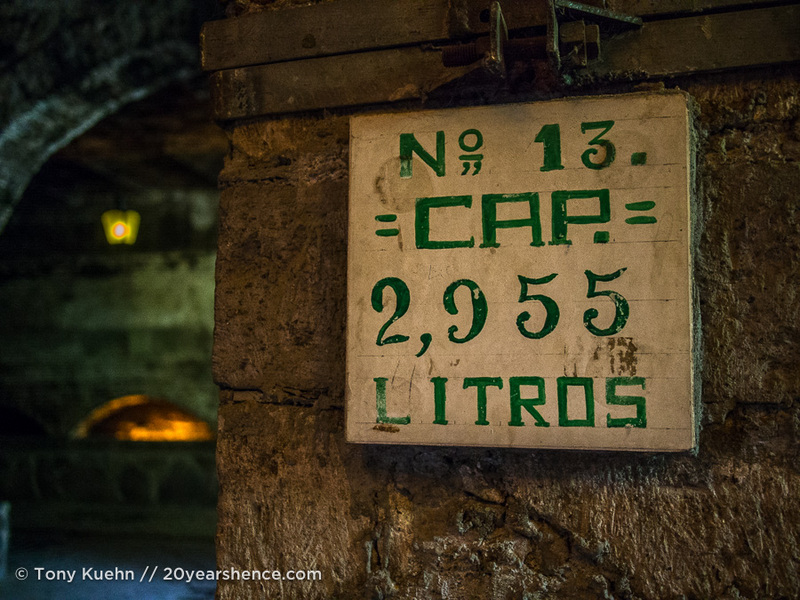 This process is undertaken twice as the result of the initial cook (“mosto muerto“) is impure and is incredibly strong… as in, take a swig and you’ll go blind! The result of the second cook is known as white tequila and is safe for consumption and can be bottled and sold. However, some of the tequila will be placed in charred oak barrels and then left to age for a period of time—this is how the amber-colored tequila is produced, and the proof of the tequila will depend on the length of time it is left in the barrel (the longer it sits, the stronger it will get as more of the liquid will evaporate forcing the alcohol to become more concentrated). 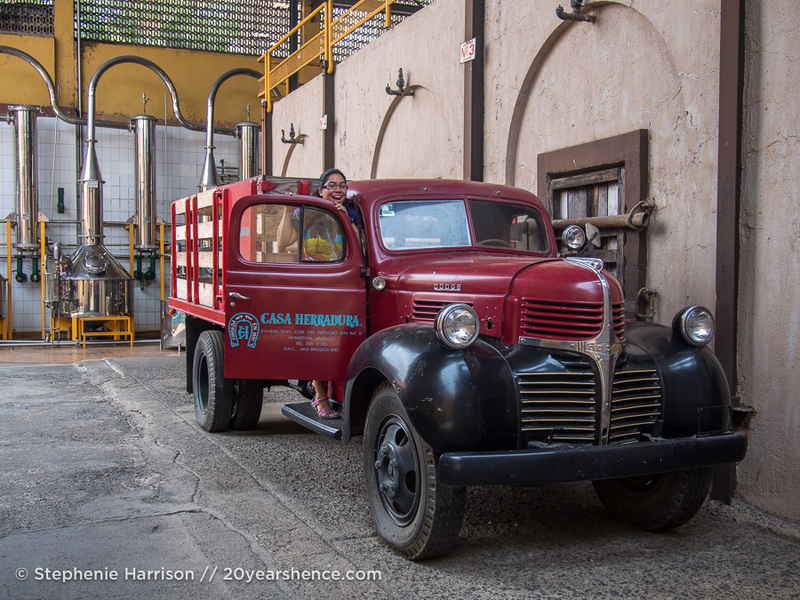 Normally this would be the time on a distillery tour where we would retire to the tasting rooms to sample the various tequilas, but at Casa Herradura, we learned that there is one final treat in store: a tour of the old factory! We got to see the volcanic stone pit (essentially like a giant mortar and pestle!) where the agave was processed (by a donkey… perhaps one of Cuco’s ancesters? 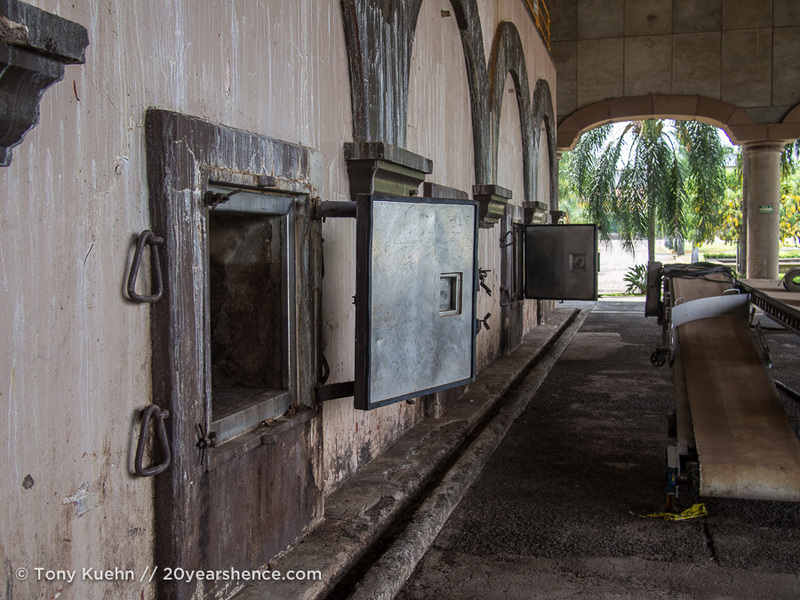 ), as well as the pits where—and I swear to God this is not a lie—the sweat of naked workers was used to catalyze the fermentation process, as well as the original copper stills where the tequila was distilled. Although this part of the hacienda is now just a relic (thankfully the process is a far more hygienic these days! ), it was really incredible getting to see that slice of history. 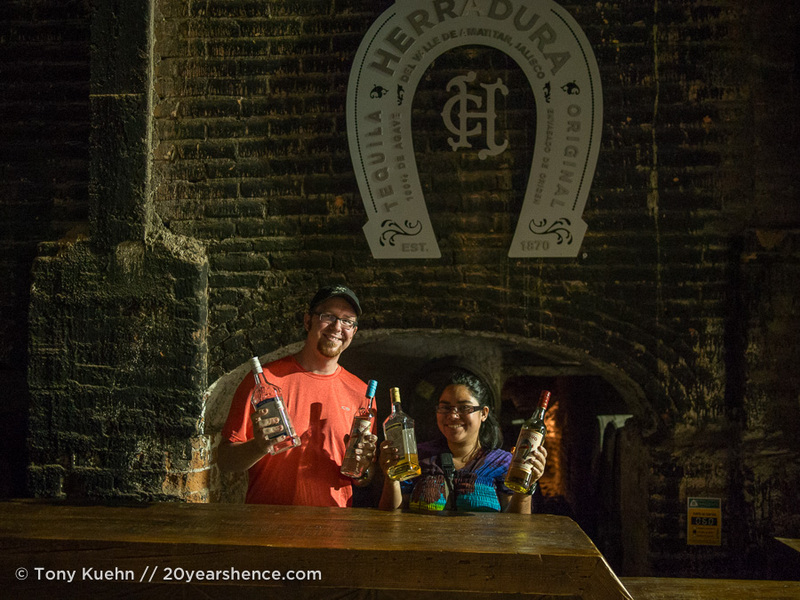 It certainly made us appreciate the (sweat-free) samples of tequila that were to come all the more! Speaking of which, the last stop on our tour was the tasting room where we got to sample four different tequilas: two whites and two reposados (meaning they had been aged). And lest you worry that things were about to devolve into debauched scene out of a Spring Break vacation, rest assured there were no wedges of limes or body shots happening here! Our guide gave us thimble-full shots of each one and told us that we should start by gently sniffing the aroma of the tequila. Then we should take a sip, and allow the tequila to rest on our palate for a few seconds. Only then should we swallow, making sure to allow the tequila to bathe over the roof our mouth while doing so, and inhaling shortly thereafter. When exhaling, a new spicy sensation would result, allowing us to appreciate a different layer of flavors to the tequila. Prior to our tasting, Tony and I were pretty much tequila novices (which is to say we had each had bad experiences with this devilish drink previously and didn’t have many pleasant memories associated with it), but this tasting definitely helped us appreciate the subtlety of the flavors that can arise from a good tequila. I was surprised by the smokiness of some of the varieties we tried, and I actually found the flavor to be similar to some bourbons I have sampled. I suppose that shouldn’t be too surprising since many of the charred barrels that are used for aging tequila come from American bourbon distilleries, but given the different ingredients used between the two spirits, I expected the flavors to be quite distinct. I’m sure the similarity is why Tony left our tasting with a newfound appreciation for Mexico’s joy juice. We paid $150MX (~$10US) per person to visit Casa Herradura and I have to say it was well worth it. There were more expensive tour options you could choose that would allow for a more extensive and high-end tasting experience at the end, but mindful of the fact that one of us would have to drive home, we were more than satisfied with the tour we received. Because we visited during the week, we were the only people on our tour and so what is normally supposed to be an hour, wound up taking about 90 minutes instead as our guide let us spend extra time wherever we pleased… including the tasting room, where we were offered seconds (and thirds…) of whichever tequilas we liked best. Also, our guide spoke excellent English, so if you don’t want the challenge of trying to understand Spanish while lightly buzzed, fear not. Flushed from the amazing tour at Casa Herradura, we decided to spend a little bit of time poking around Amatitán proper. I suspect that most people quickly speed off to the next distillery, but I’m glad we took a little time to wander the streets of Amatitán first. Not only did it give us a chance to sweat off some of the alcohol in our system, but it turns out that Amatitán is also ridiculously cute. 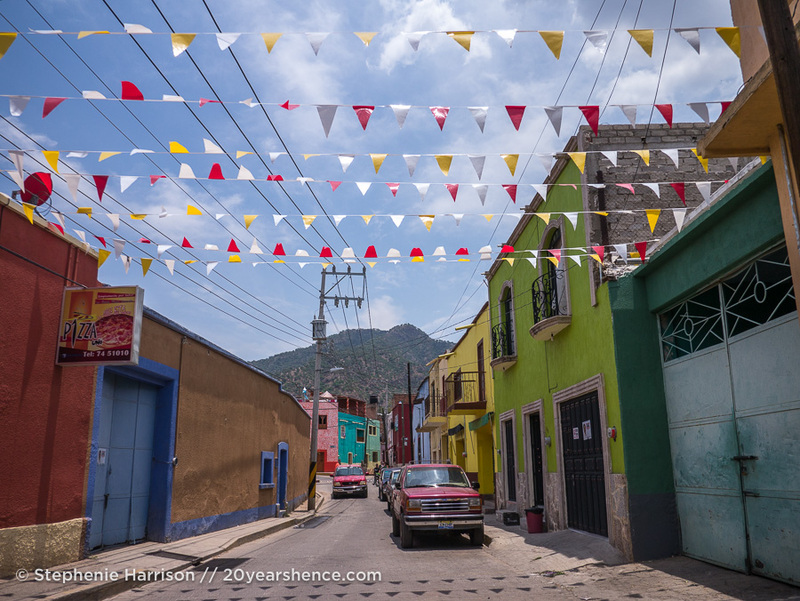 Every cobblestone street was festooned with flapping festival flags and the buildings were all painted bright hues, there was nothing especially spectacular about the town to recommend it, except that it just felt like the Mexico out of a fairytale, untouched by American culture or 21st century modernity. 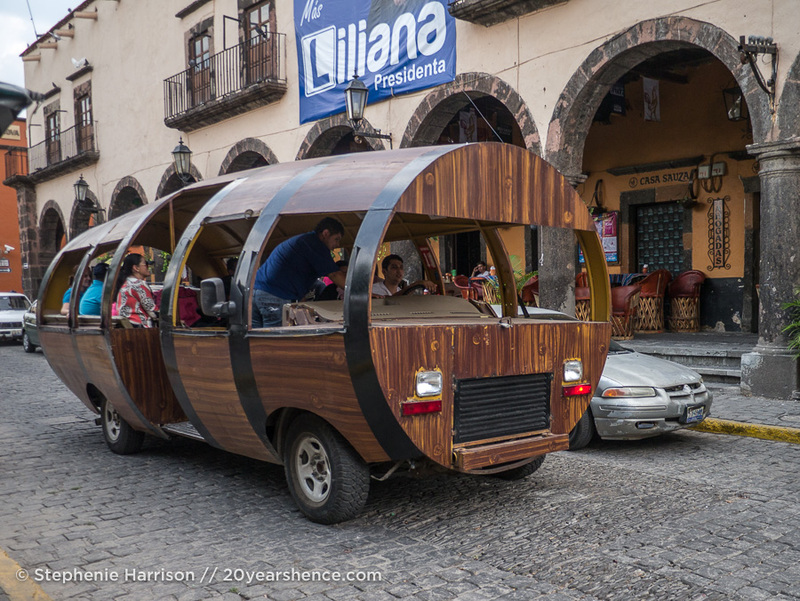 Witness Mexico’s traditional method of transportation: the barrelmobile. With pangs of regret, we bundled ourselves back into the car and continued north to Tequila. We had read that the town had largely managed to escape the trappings of a tourist town and were expecting it to charm us the way Amatitán had. What a rude awakening we were in for! Although a UNESCO world heritage site, the main drag of the town was relatively underwhelming and non-descript, and while the huge church in its central square was a sight for sore eyes, the area was surrounded with overpriced restaurants, souvenir shops, and we couldn’t walk more than ten paces without someone asking us if we wanted to take a tour. I guess we’ve been fairly off the grid here in Mexico, because these were the only touts that we’ve encountered thus far in the country and they really bummed us out (especially as some of them were children, a big no-no in our books). Because we paid for parking, we spent about an hour walking around central Tequila (stubbornly refusing to eat at the tourist restaurants and slumming it in a Chinese restaurant that all of the locals were flocking to instead!) feeling fairly underwhelmed. 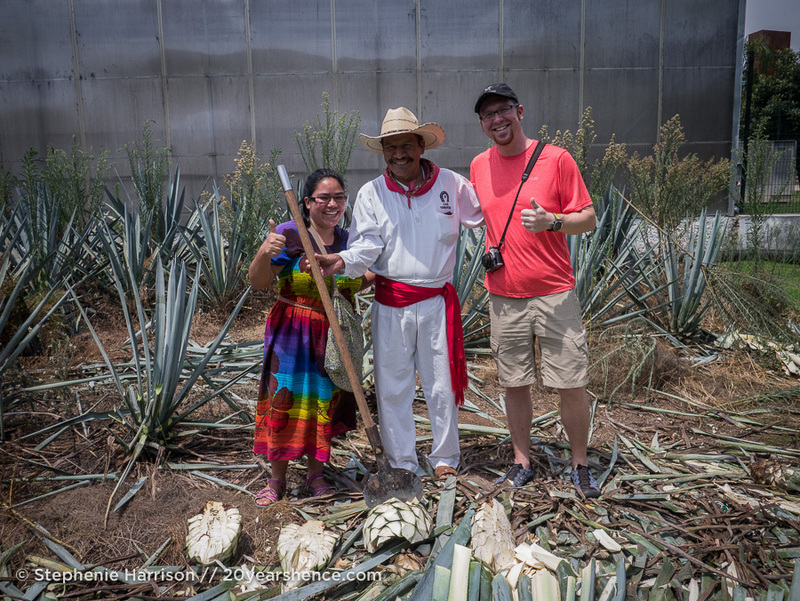 We considered taking the tour at Jose Cuervo, which is supposed to have all the bells and whistles…only to decide that we didn’t really need to pay $200MX/person for another run-through of how tequila is made, especially when the price didn’t include any tequila tastings at the end! Tequila itself felt like a big rip off and we didn’t feel any need to stick around. Unlike Amatitán where it felt the town existed irrespective of the nearby distillery, Tequila felt like it revolved around not so much its eponymous liquor but the tourists who come to town in search of it. We had considered potentially spending the night in Tequila but, like a few other places we have visited, we wound up cutting our time there short and were relieved to get back on the road. Not to put too fine a point on it, but Tequila was definitely a bit of a buzzkill. We left Tequila much earlier than anticipated, so decided we would take the long way home, a lazy loop that would take us through some of that infamously pretty tequila countryside we had heard such good things about. I guess I shouldn’t be too disgruntled about how disappointing we found Tequila because this part of our drive was definitely the best. The landscape was suitably dramatic with dusty fields blanketed with the smokey grey-blue hued agave plants and gently rolling mountains in the distance. The towns we drove through were more reminiscent of Amatitán than Tequila, where the vibe was chilled and laidback and the buildings were pretty. True, one of the roads we wound up on was little more than rutted gravel and felt like it would knock the fillings out of our teeth, but thankfully that only lasted for about 20 minutes and then we were back to cruising on smooth asphalt. 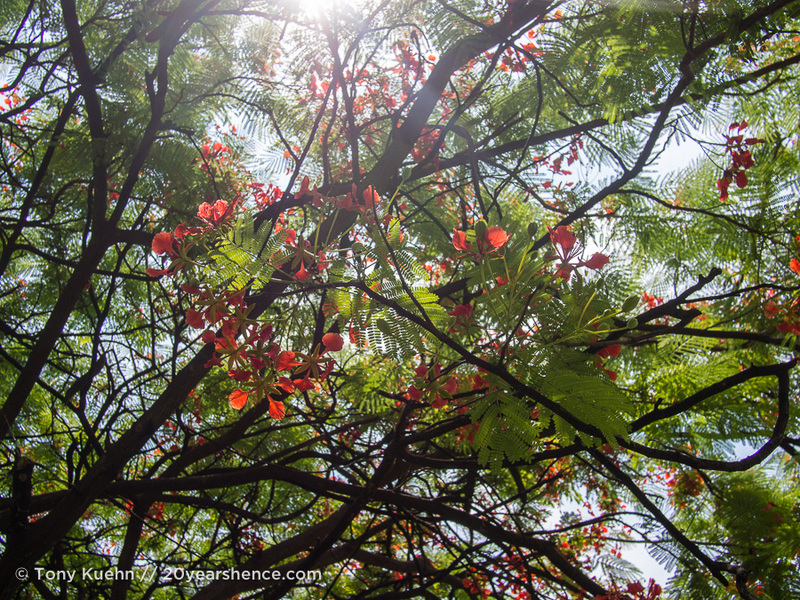 As we pulled into our driveway back in Tlaquepaque, the first fat rain drops of what would become a mighty thunderstorm, splattered on our windshield; without any real schedule, our timing and return home managed to be perfect! Now it’s your turn! Tell Us: Are you a tequila aficionado? If so, what’s your favorite brand? If not, would you be interested in visiting this region of Mexico? Would you prefer to self-drive the trail, or do you think a packaged bus tour (or perhaps the train!) would be more your speed? Since I am a huge Tequila fan, I can’t wait to get back into the land of agave:) I am glad to see your report, however. 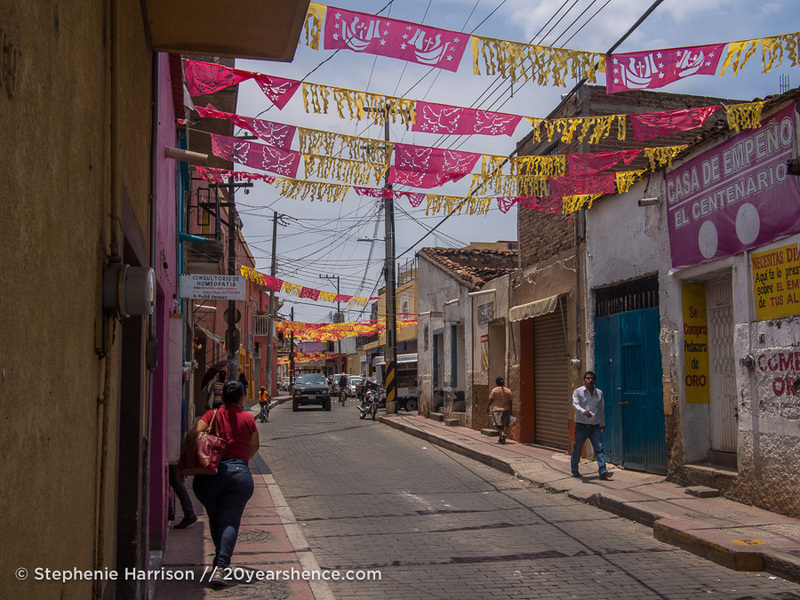 While I”m sure we’ll go through the town of Tequila, everyone does at some point, I can see we, too, are going to appreciate the towns a bit further afield. Maybe if we hadn’t been on such a strict deadline (our pups were waiting at home!) and had been able to take a bit more time in Tequila proper we would have enjoyed it a bit more… but, it was really pretty touristy and I do think it suffers for it. Also, the Jose Cuervo tour really seemed like a rip off; if I were to ever go back to Tequila, I’d make an effort to check out some of the lesser known distilleries there, I think. We really enjoyed having our own set of wheels as it did allow us to see some of those smaller towns that we might have missed, however if you’re just interested in Amatitán and Casa Herradura, I know there is a bus/train tour that heads out there (but then you’ll have to deal with larger groups, which I think would be less fun!). The countryside around Tequila was definitely not a disappointment! 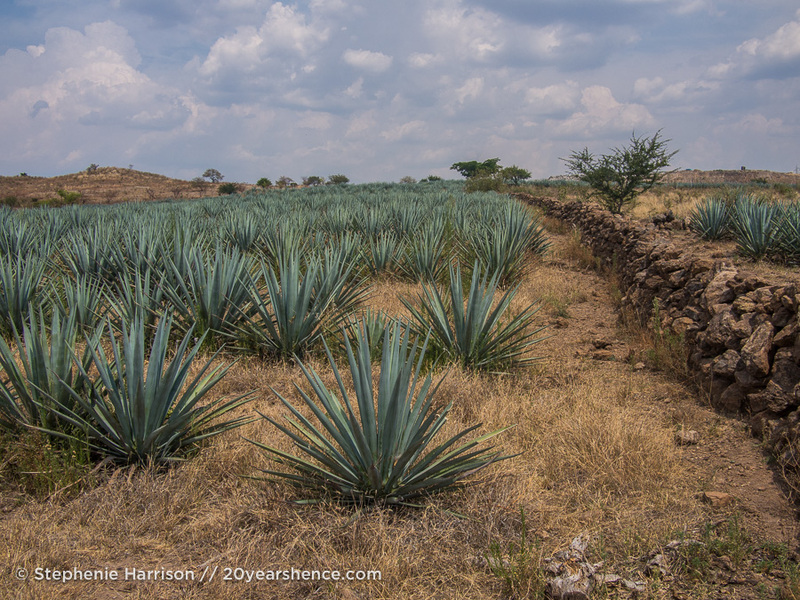 We got to see some smaller agave fields while at Casa Herradura, but they were nothing compared to the huge plots of land between the towns and cities in the part of the country. And the distillery tour was legitimately interesting and well worth the cost and the time. If you’re ever in that part of Mexico, I can’t recommend it highly enough! You guys! I thought we outdid ourselves there with the bourbon whiskey distillery tour in Kentucky…turns out we have so many other drinking trails to discover! And while you are totally right about safety first, perhaps taking your own set of wheels then ensures moderation? 😉 One day we will follow in your brave footsteps!! We are not huge drinkers to begin with, so limiting ourselves to just a few sips throughout the day wasn’t a huge hardship and was worth it given the freedom we were granted to explore at our own pace. The one advantage the KY bourbon country has over tequila country is that the tastings in Kentucky tend to be completely free, which was nice… but definitely not good for encouraging moderation! That said, the tequila trail really is a fascinating window into a slice of traditional Mexicana, so it is well worth spending a day or two exploring it if you’re ever in that part of Mexico. I am always amazed at how interesting I find distillery & brewery tours, especially since most alcohols are distilled in essentially the exact same way, it’s just the ingredients that change! And yet, I always find myself learning something new and thoroughly enjoying the process. I don’t regret touring the trail on our own, but I do think it would have been really fun to take the tequila train (because who doesn’t love a train???). Next time we’re in that part of Mexico again we’ll have to give it a whirl and see how it compares! It’s funny but I was actually thinking of tequila the other day – the drink I mean – and wondering what it was actually made of and from where. Surprisingly, I thought it was Ecuador or somewhere more exotic. It didn’t even occur to me that it would be in Mexico LOL! I’m very cautious about tequila and handle it very much with care. The last time I had “some” shots with a bunch of German women who really should have known better, we all ended up rather the worse for wear, going to someone’s house and crawling on our hands and feet from the door to the living room because no one could actually walk LOL! One shot, perhaps two, is enough is me these days! Victoria@ The British Berliner recently posted..I’m going to Budapest & Prague AND taking the train. Yay! Ohmigawd…I’m so putting this on my to-do list! Loving your space here, by the way. Ha! Love your enthusiasm, Amrita! Thanks so much for taking the time to comment & we hope you have a blast visiting Tequila. Ahhmazingly descriptive post! I hardly ever read a complete blog entry..I typically skim to abstract desired material. However, yours was a joy! Reading while enroute to Herradura distillery..and it helped reinforce our thoughts on what appears to be over commercialized Tequila tourists traps! Thank you for the info/input!